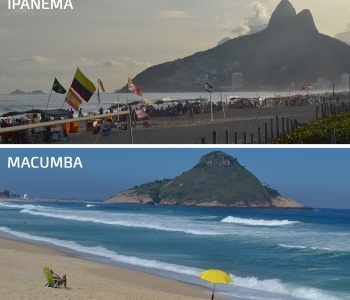 I love the beaches of Barra da Tijuca, Recreio, Prainha and Grumari! We go there often on weekends by bus from Ipanema. The metro line 4 only takes you to the beginning of Barra, so the bus is still the best option if you want to explore more distant beaches. But I´m constantly having a hard time catching a bus, as I don´t know where they stop. Sounds weird? Maybe I am just a dumb gringo, not knowing where the bus stops are? But the locals in the bus stops are always asking from me the same question: are the buses going from here? So, what´s the deal here. All the buses to Barra run on the beach promenade (Av. Vieira Souto). Other buses run on Prudente de Morais, a parallel street, one block from the beach. Plain and simple. Now, this is where it gets interesting. 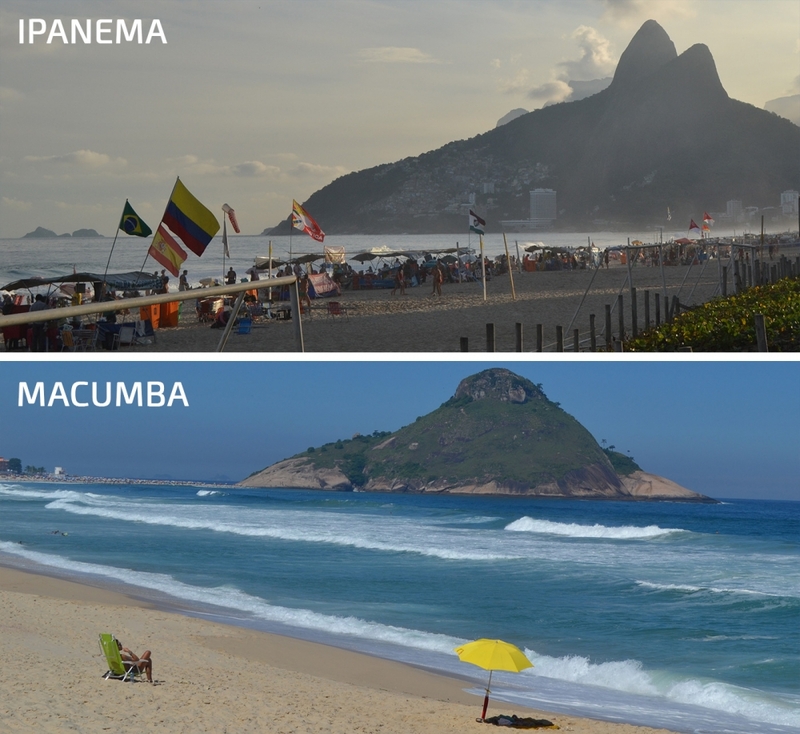 Ipanema beach promenade consists of two separated roads, one in each direction. On Sundays and public holidays the road towards Copacabana is closed and people use it for running, walking, biking, skating and skateboarding. The road towards Barra is still open. But the direction of the traffic is often inversed, and then sometimes not. When the traffic does run in the other direction, then Barra buses go from Prudente de Morais street. When it is not inversed, then they drive on the beach promenade. One Sunday we were waiting on Prudente de Morais, to go to Macumba beach. There were us and a few locals, all eager to catch a bus to Barra, as this is the street where Barra buses usually drive on Sundays. Tens and tens of buses drove by, none of them to Barra. Everyone had a confused look on their face. The kind you get when you don´t really know what’s going on, but don´t want to seem stupid for doing the wrong thing. Finally, people started asking from each other, if the buses are driving today. After about 20 minutes we gave up and thought of just staying on Ipanema beach. We left the others waiting. As soon as we reached the beach promenade, we saw Barra buses driving by, on the street they should not drive on Sundays. Convert back to plan A, this is something that you will get used to while living in Rio. The constant change of plans – the best plan is no plan here. We threw our hands up to stop the bus, as this is what you should do to have a chance of catching a bus. No, I do not mean to catch a bus, I mean to have a chance of catching a bus. The bus drivers of Rio are famous for their ability to overlook passengers in the stops and just speed by, leaving the people hands up on the roadside, as it was a rock concert. This is what happened to us. It´s fine, we are used to this. But this event always creates another complex question to solve: did the bus driver just miss your signal or are you standing in the wrong location. The beach promenade does not have bus stop signs. How to solve the “bus stop or not” riddle? Don´t bother looking for a bus stop sign. In this situation, first thing you do is check if other people are waiting near you. It will not guarantee that it is a bus stop, but there is strength in numbers. If many people are hailing for a bus in the wrong spot, then often the buses will stop. If there are no other people besides you, then you should check if there are people up or down the road from you. Determine the closest bunch of people (sometimes even 1 or 2 persons) and move to them. This is good for two reasons, firstly it could mean that it really is a bus stop, secondly, there is strength in numbers. If there are no people in sight, don´t worry, there can still be a solution. Check for traffic lights. Usually the buses don´t stop in front of an intersection. Move to a location right after the intersection, this is where buses can stop and pick up people. This will up your chances. If the next bus still passes you by, regardless your waving, pointing and maybe even whistling, repeat the exercise. You are bound to reach a legitimate bus stop at some point. Good luck. By the way, asking people on the street usually does not work, as they are mostly as clueless as you are. in worst case, the driver will kick you out of the bus and you must try your luck with the next bus. Do not start an argument with them, sometimes it can end up with a baseball bat fight with the driver (true story). This time we were not lucky, nor even semi-lucky. We had to step out of the bus, we so hard fought to catch. At this point, at least, you know that you are standing in a place where buses stop (still, not necessarily a bus stop). After a total of over 40 minutes of trying to catch a bus, we were able to reach a situation, where everything was perfectly aligned – we were on the correct street, buses drove in the suitable direction, we were standing in a bus stop (presumably), other people were with us, the bus stopped for our waves, the driver had change for our 50 bill. Finally, we could sit down, enjoy the marvelous views of Avenida Niemeyer, reach Recreio and continue to beautiful Macumba beach.